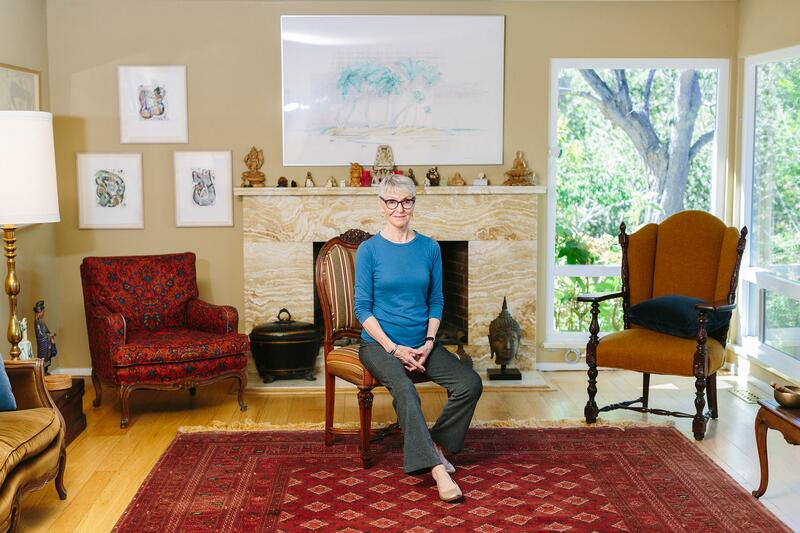 Jean Couch, 75, perches on the edge of a chair at her home in Los Altos Hills, Calif. She teaches people the art of sitting in chairs without back pain. But for most of Western history, people sat on chairs that were relatively firm, flat and proportioned for the human body. Then in the 20th century, designers got their hands on new materials, such as steel, plastic and foam. And chairs started blowing up in size and softness. "The 20th century was all about experimenting with technology and forgetting about the body," says Galen Cranz, who studies chair design at the University of California, Berkeley. As a result, we've ended up with living rooms, offices and restaurants filled with chairs that are really bad for our backs, Cranz says. "It's shocking how poorly designed they are for our bodies." "Now we need to use props and techniques to sit in chairs in a way that's good for our backs," says Jean Couch of Palo Alto, who is part of a growing movement on the West Coast to teach people to move and sit as they did in the past. Almost every chair has one of two problems: They're too deep or too soft, Couch says. "When a chair is too deep, the backrest is too far away from the edge and you can't put your legs [feet] on the ground without slouching," she says. "Else your legs stick out like a little kid." And when chairs are too soft, it's almost impossible not to slouch. "The chair causes your hip bones to fall back and your spine bends into a C shape," Couch says. Slouching a little bit every now and then isn't a problem, says Stuart McGill, who studies spine biomechanics at Waterloo University in Ontario, Canada. "But if you repeatedly expose your spine to this bending, it will become pain-sensitive in most people." Over time, you also run the risk of damaging the disks. So should we all run out and buy new chairs? "That's not necessary," Couch says. These three tricks can basically get you comfortable — with a straight spine — in any chair. 1. Sit on the edge of a chair. "So if I walk into a room and see only soft and deep chairs, I will look for a chair with a frame," Couch says. "Then I'll sit on the hard, front part of the chair." In other words, forget about the back rest and use the wooden frame of chairs as a firm support. That makes it easier to keep your pelvis from tucking under your spine and your back ending in a C shape. And be careful how you position your legs, Couch says. "The big trick is to have your knees below the hip socket." Most people think the knees and hips should be at the same level, Couch says, so that the angle between your torso and legs is 90 degrees. But you'll be more comfortable — and less likely to slump — if that angle is bigger than 90 degrees, Couch says. "Something like 120 degrees," she says. Astronauts' legs automatically take this angle when they're floating in the space station with microgravity. NASA calls it the neutral body posture because it's when the muscles are relaxed. "So I'm perched right now," Couch says as she sits down on her kitchen chair, which is clearly too soft. "Way too soft." To fix it, she takes a firm pillow and places it a few inches from the chair's front edge. Then she sits down on the front of the pillow. So the pillow is tilting her pelvis forward a bit, and she's kind of elevated above the chair. She says you can really use anything to build a perch — a wool blanket, a jacket, a rolled up yoga mat. "I've sat on my wallet, a shoe, a folded sweater, but the best is a wedge," she says, as she pulls out what looks like an incline plane. "It's a wedge-shaped pillow, and it's pretty dense foam," Couch says. "You want it as dense as you can get for it to really help." Whether it's a wedge, a shoe or your husband's wool sweater, Couch says, these props help in two ways. First, they give you something firm to hold up your sitz bones (sitting bones). "When it's too soft, my hip bones fall back and then I'm in that nasty C shape," she says. And second, the pillow raises your hips up a bit so it's easier for your knees to drop below and your legs to find that sweet spot of comfort — 120 degrees from your torso. 3. Build out the back. The first two tricks work great for most chairs. But there's one situation in which sitting on the edge or perching on a pillow isn't a good idea: in the car. "You definitely don't want to be sitting away from the backrest for safety reasons," says Esther Gokhale, who also teaches posture and traditional movement in Palo Alto. "You have to be up against the backrest and headrest or you could get whiplash in an accident." But there's a big problem with the backrests in many cars and airplanes: They are shaped like C's. If you use them properly, they force you to slump and bend your spine. "The only solution is build out the backrest so it's more planar," Gokhale says, so you turn the C shape into an I shape. To do that, Gokhale says, grab one of your perching props. Take a firm pillow, a blanket or sweater and stick it right at your mid back. "Then elongate your spine by gently stretching your back over the pillow," Gokhale says. And voila! You've turned a painful, slouchy chair or car seat into a comfortable one. We're going to spend the next several minutes talking about an object that you spend a lot of time with - your chair. Why are so many chairs so bad for people's backs? NPR's Michaeleen Doucleff investigated, and she's written us to say that this story will have you on the edge of your seat. MICHAELEEN DOUCLEFF, BYLINE: For thousands of years, most chairs were made of wood. When upholstery came along, it was mainly for rich people, but most people sat on wooden stools, benches and simple chairs. And in general, they were firm and flat. Then about 70 years ago, everything started changing. Designers had access to new materials like steel, plastic and foam rubber. Galen Cranz studies chair design at the University of California, Berkeley. GALEN CRANZ: The whole 20th century is all about experimenting with a new technology. DOUCLEFF: Designers realized they could make chairs in any shape they wanted, and their creativity exploded. DOUCLEFF: Take for example the Barcelona chair. DANIELLA OHAD: Considered one of the best designed chairs of all times. DOUCLEFF: That's design historian Daniella Ohad in her video devoted to the chair. It was made by the German designers Ludwig Mies van der Rohe and Lilly Reich in 1929 for the king and queen of Spain to sit in. It hit the mass market in the '50s. OHAD: It became the most popular chair in Americans' lobbies, reception rooms and office spaces. DOUCLEFF: You've probably seen it in furniture stores. It looks like two giant chocolate bars set at right angles and floating atop steel poles. It's lovely. OHAD: The chair embodies the Mies principle that anything less than perfection is unacceptable. DOUCLEFF: But Cranz says there's just one problem with the Barcelona chair and many famous midcentury modern chairs. They are really bad for your back. They can make your posture worse. CRANZ: Yeah. They make it much worse. DOUCLEFF: ...Honored as these great designs. CRANZ: Yes. All these chairs are in the Museum of Modern Art, and every chair collection has them. They're at the lobbies of our most prominent corporations on Sixth Avenue or in New York City. But they're not good for us. DOUCLEFF: Cranz says many chair designers have forgotten about the human body and what it needs to sit in a healthy way. As a result, we've ended up with living rooms, offices and restaurants filled with chairs that hurt our backs. CRANZ: It's shocking to realize that they're poorly designed for our bodies. I mean, I didn't believe myself for a while. It was like, how can this be? Well, it is. DOUCLEFF: Almost all chairs have one of two problems. Some of them have both. First off, they're too deep. The backrest is too far away from the edge of the seat, so your legs stick out straight like a little kid. Second, they're too soft - way too soft. STU MCGILL: Comfort does not come from sitting in a soft and very plush kind of couch or chair. It's actually the opposite - very firm seat pan with a good amount of lumbar support. DOUCLEFF: That's Stu McGill, who has studied spine mechanics for 30 years at the University of Waterloo in Ontario, Canada. He says the problem with soft chairs and ones that are too deep is they cause people to slouch or slump. And when you slouch, you do something bad to your spine. You bend it into C shape. MCGILL: That puts more stress on the spinal discs. DOUCLEFF: Those little rings of collagen that help hold your spine together. McGill says they're a bit sensitive to bending. MCGILL: That's not an issue over the short term. But if you prolonged expose it to bending, it will become pain-sensitive in most people. DOUCLEFF: You also run the risk of damaging the discs, which can be excruciatingly painful. So what can you do? It's probably not feasible to throw out all your soft and deep chairs and start over. And Jean Couch says it's actually not necessary. JEAN COUCH: We have techniques or, you know, props we can use that will help us. DOUCLEFF: Couch has been teaching people how to sit with a healthy posture in Palo Alto for about 25 years, and she says there are two tricks you can use for basically any chair. Number one - sit on the edge. COUCH: I find the frame and sit on the hard part of the chair. DOUCLEFF: In the front part. COUCH: Yeah. And now I'm so much more comfortable. DOUCLEFF: In other words, forget about the backrest and use the wooden frame of the chairs as a firm support. That makes it easier to keep your back straight and not slump. And Couch says, be very careful about how you position your legs, especially your knees. COUCH: The big trick is the knee is below the hip socket. DOUCLEFF: When you're sitting, take a look at your knees and where they are in relationship to your hips. You'll be a lot more comfortable and less likely to slump if your knees are below your hips. Actually, this is what happens to your legs when you're floating in space. NASA calls it the neutral body posture because it's when the muscles are the most relaxed. And there's another way to help get this posture when you're sitting. Couch says build a perch. COUCH: So I'm perched right now. DOUCLEFF: Couch has taken a firm pillow and placed it in the center of the chair, and then she sat down on the front of the pillow so she's kind of elevated above the chair. She says you can really use anything to build a perch - a wool blanket, a jacket. COUCH: I've sat on my wallet. I've sat on a shoe. COUCH: But my favorite is - I'm always like with my husband - I'm like, Michael (ph), could I borrow your sweater? DOUCLEFF: But Couch does have a favorite pillow that she thinks works the best - a wedge. COUCH: So it's a wedge-shaped pillow. And it's pretty dense foam. So you want it as dense as you can get it. DOUCLEFF: You can find these pillows online, and Couch says they're great for using in the car where the seats can be really, really hard on your back. COUCH: And any little thing will help better than nothing. DOUCLEFF: Because even if you're not having problems now, chances are you might in the future. Eighty percent of Americans experience back pain at some point in their lives. Michaeleen Doucleff, NPR News. INSKEEP: If you want a tutorial, see these sitting tips in action and also learn how to deal with painful seats in cars and planes, go to our health blog Shots at npr.org, and you will find the videos. (SOUNDBITE OF MOOG'S "RIVALS") Transcript provided by NPR, Copyright NPR.